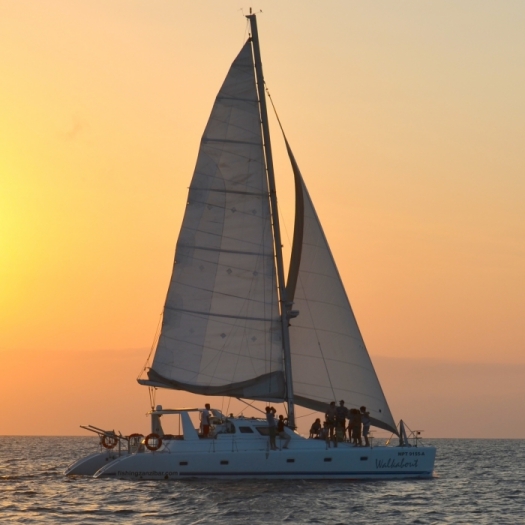 Meet our Zanzibar Yacht Crew - Zanzibar Yacht Charter. Meet our Zanzibar Yacht Crew! Our team of spectacular, hardworking, dedicated and fun loving professionals! All of us are here to make your experience onboard our yachts a trip of a lifetime! Call us and usually the first person you will speak to is Sabina! 🙂 Not only does she manage our bookings, she answers the emails, sells our charters, runs our office and makes sure our yachts are prepared for your charter! Sabina is also a qualified Yacht Captain (Yacht Master Offshore), a PADI Dive Instructor and a Yoga Instructor! Furthermore, she is super energetic, fun loving and very efficient when it comes to her job! She speaks Spanish, Italian, English and Kiswahili. Also, if you are lucky enough to have Sabina onboard your charter, (she is usually very busy running the show), you will be blown away by the wonderful dishes she prepares in the galley! Her cooking is fantastic! Needless to say, with her amazing smile and outgoing personality, we are thrilled and priveledged to have Sabina on our team! Affectionately known as Wally, Mwalimu is a long serving, dedicated, hardworking and highly motivated member of our team! He has a lifetime of experience fishing and sailing the waters of Tanzania and Kenya. Therefore as a fishing Captain he is extremely knowledgeable of this East African Coastline of ours! Initially Mwalimu started out with us as a deckhand in 2007. Since then he has studied hard and passed his Power Boat Level 2 course with the RYA. Presently Mwalimu is a proudly qualified Captain onboard our sport fishing charter boats. When Wally is not out on a fishing charter, he joins us onboard our live aboard yacht charters as crew and part time chef... 🙂 In conclusion, with his insatiable thirst for knowledge, a fantastic smile and endearing personality, we are very proud to have Wally onboard our team!